Did we respond in a timely fashion? Did you recieve clear communication throughout the project? Did the salesperson show up on-time as scheduled? Did they conduct themselves in a professional manner? Were they knowledgeable when answering your questions? Did they thoroughly discuss all of the work to be completed? Did they arrive at the scheduled and promised time? Was your electrician knowledgeable and able to answer all of your questions? Did they complete the job as explained by the salesperson? Did they show you all of the equipment installed? Are you likely to continue services with us? Would you recommend our services to someone inquiring about generators? 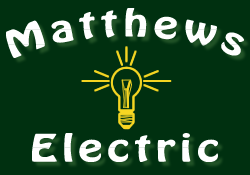 Please feel free to share any additional comments or feedback with us that you feel we should know about your experience with Matthews Electric Inc.